As soil biology becomes increasingly recognized as a critical component of productivity, the first choice for professional soil testing laboratories is the Solvita CO2 Burst standard lab protocol. 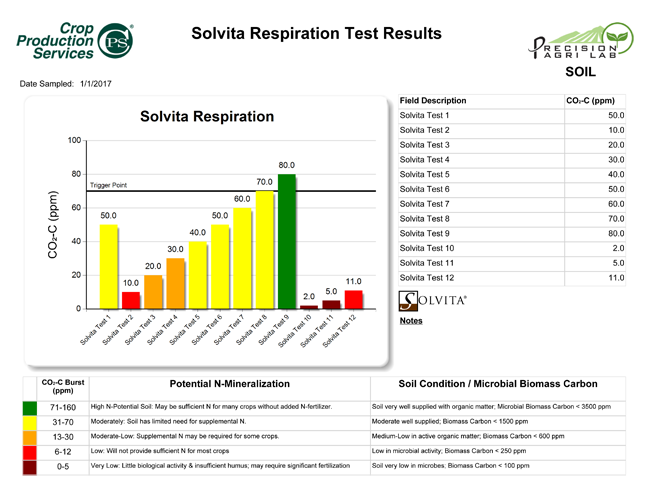 You’ll find a new level of precision for soil health testing as the Solvita method is easily adaptable. 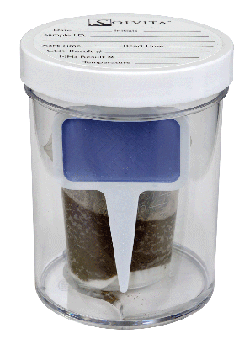 Dried, weighed samples of soil are moistened with a specific amount of water, triggering a flush or “burst” of carbon dioxide. The magnitude of the burst is measured with the Solvita Digital Color Reader. The CO2 Burst is proportional to microbial biomass and directly tied to potential carbon and nitrogen mineralization. The rate and quantity of CO2 release over a specific period is generally regarded as an accurate indicator of biological attributes favoring Soil Health. The “turnover rate” of CO2 from soil rises with improved management practices. Such practices include cover cropping, reduced tillage and organic amendments which assist to build soil residual organic matter and plant litter, the food base of soil microbes and invertebrates. Measuring the rate of carbon exchange via soil respiration is indirectly linked to nutrient “mineralization” – the potential release of nutrients such as nitrogen and phosphorus that are components of plant residues, microbes and humus. Why is CO2 respiration important? Presently, soil biology has become increasingly recognized for its critical role in crop productivity. For this reason, it is no longer sufficient to only test for inorganic nutrients in soil. Soil testing standards are changing, and an increased number of labs, growers and crop consultants see the need for including some measure of soil biology. Solvita is a test and a procedure with a 2-decade history that fulfills the need and promise that farmers can assess soil biological functioning. Solvita is a test which provides a fairly rapid and inexpensive means for labs to measure CO2 respiration, one of the most fundamental biological phenomena of soil systems and the primary indicator of carbon cycling. Without CO2 respiration, no litter would decompose and no organic compounds would be recycled back to available nutrients. In fact, soil CO2 respiration is the principle controlling force in planetary atmospheric CO2 concentrations.